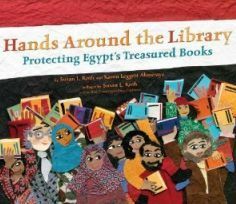 Text and illustrations describe how Egypt's students, librarians, and demonstrators gathered around the Library of Alexandria in January of 2011 amidst turmoil to protect the building which stood as a representation of freedom. It refers to a real event that took place in Alexandria, Egypt, in 2011. That year, Egypt witnessed a popular uprising: Protests by hundreds of thousands of young people filled the streets of Cairo and Alexandria calling for the end of the regime that had been in power for several decades. Their actions eventually led to the fall of the Egyptian president, Hosni Mubarak, as well as members of his government. This is our library. Don’t touch it. ” And the library was not touched, and its collections were protected by peaceful protesters who loved their institution and did not want to see any harm done to it. Her photograph can be found also at the end of the book, in a collection of photos of the Bibliotheca Alexandrina. The main protagonist in the book depicts how she joined the protesters and marched holding posters calling for the fall of the regime. She describes her feelings of excitement and hope, but also of fear as she learns that angry protesters had set fire to cars and burnt down a police station. What if they tried to burn down the library as well? The realization of what this would mean terrifies her: ”Our ancient Egyptian stories are kept alive here, in the books, and in the carved stone…We were free inside the library even when we were not free outside. We could not let our Alexandria Library burn. The story is illustrated with striking collage created by Susan L. Roth, the author and/or illustrator of more than forty books for children, including Listen to the Wind, a # 1 New York Times bestseller. The background of the book flaps and of some of the illustrations is a photo-montage inspired by the 500 different alphabets carved on the granite wall of the library. The head coverings, and the decorative quilt motifs in the book were inspired by wedding tents set up for celebrations in Egyptian cities. Many of the posters shown in the book are in Arabic script. Karen Leggett Abouraya, the co-author of this book is a radio and print journalist, who has served as president of the Children’s Book Guild in Washington DC. She has also reviewed children’s books for the New York Times. Aburaya was assisted by her Egyptian family in taking the photographs for the book, and she thanks her husband for his Arabic translations, and sharing his cultural sensibilities. notes and additions, and more core story about the library itself, what it holds, how it is organized, why it is so important, in the voice of the protagonist rather than in that of the authors. Recommended. This review reflects the opinions of the reviewer, and not the views of the Library of Congress.